I used to get a lot of leg cramps at night. You get woken up by the feeling of your muscles in your calf suddenly tightening. It feels like the muscle tries to contract and then gets locked in the spasm. It usually lasts 5-10 seconds and then goes. The next day the calf muscle is a little sore. You can still cycle on it, but you don’t feel like training hard. It is frustrating because it interrupts training. After a day of no cycling and complete rest. Stretching the calf muscle sometime during the day. – especially important on days of no cycling. A simple calf stretch is to stand facing a wall with back straight. Keep your heel pressed to the floor and extend the leg until you feel a pull in your leg. Avoid getting dehydrated during the day and take on extra salts. In particular magnesium is said to be important for avoiding leg cramps. 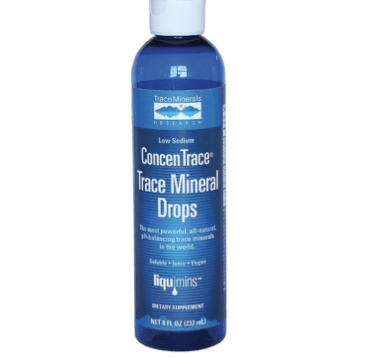 These trace minerals were recommended to me by a long distance running friend. They are reassuringly expensive at £22 a bottle. I forgot to take it for a few months, but recently had a leg cramp (after 3 days off bike and on a hot day). I thought I would start taking this again to hope the magnesium prevents the leg cramps. There might be several cheaper options – from what I understand magnesium is the most helpful mineral to prevent leg cramps. Stretching is of course free. Hi Tejvan, I have had some bad experiences over the yearsas I get cramp quite often, so when I get back from a long ride I usually drink Tonic Water as it has Quinine in it and I find this helps a lot. Yep I used to get cramp a lot, nowadays much less. It sounds like you have escaped lightly…. there have been plenty of times when I’ve had cramp in both feet at the same time. This is disconcerting, especially when using clippy shoes and pedals. Worse still is getting cramp in one of my upper leg muscles which seriously hurts and during the recent Coast to Coast in a Day I had to leap off the bike at one point. High 5 containing magnesium and other useful elements seems to help quite a bit. From what I gather cramp isn’t fully understood by Doctors and it can occur for a variety of possible reasons. Once when I mentioned this to my own Doctor she was then feeling all over my legs and feet and hands. She said I was a bit cold! For this and a few other reasons I am going to see a nutrionist soon and I’m looking forward to that. A 50/50 mix crystals with water is referred to as ‘oil’. Spray on legs and leave for 20 minutes. I no longer get cramps and sleep much better. More expensive but a bath in these crystals is very relaxing etc. 8 out of 10 adults are thought to be deficient in Magnesium which is essential in the production of energy.